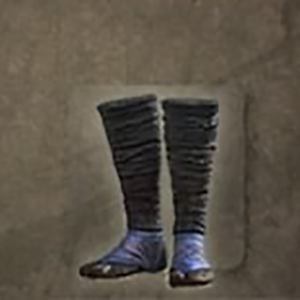 Hayabusa Shinobi Apparel: Suneate is a Foot Guards in Nioh. "These shinguards consist of thick cloth wrapped tightly around the lower leg to prevent blood congestion. They can be loosened around the ankles if need be, helping to reduce fatigue on long journeys by foot. They were used by the Hayabusa ninja, a proudly independent ninja clan based around a secret mountain. Much of the truth behind this secretive clan is shrouded in mystery, and only a secret few were privy to their arcane techniques. They differed from other clans in that they served no master and were motivated by profit; they were solely focus on ridding the lands of any evil that should attempt to sully it."